I came across this dessert from Anncoo which is so easy to make and a cooling dessert as well. It's nice to consume either hot or cold. 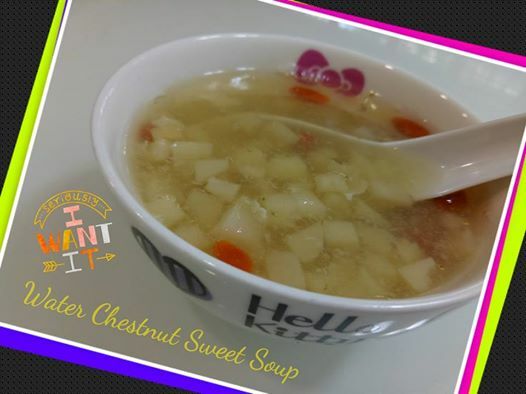 The crunchiness from the water chestnut and natural sweetness makes this a perfect dessert to cook anytime. 1. In a pot, boil water, rock sugar and pandan leaves till sugar dissolved. 2. Add in the chopped water chestnuts and goji berries, simmer at medium heat for 5 minutes. 3. Mix in the water chestnut flour liquid and keep stirring to boil. 4. Lastly drizzle in the beaten egg white and keep stirring with a fork and off heat.Can be served hot or chilled.